Our main objective is to process and ship your order as fast as possible. We offer FedEx Ground, FedEx 2 Day and FedEx Priority Overnight Options for all business days. You will be notified immediately if for any reason your order cannot be shipped within 1 business day. "In Stock" orders typically ship out the same business day if placed before 2pm CST. "Out of Stock and Special Order" products typically take 3 - 5 business days before they are shipped. *Call or Email us if you have any questions about inventory, products or delivery estimates. Once you place your order you will receive an order confirmation e-mail. As soon as your order ships you will also be sent a FedEx shipment tracking number. 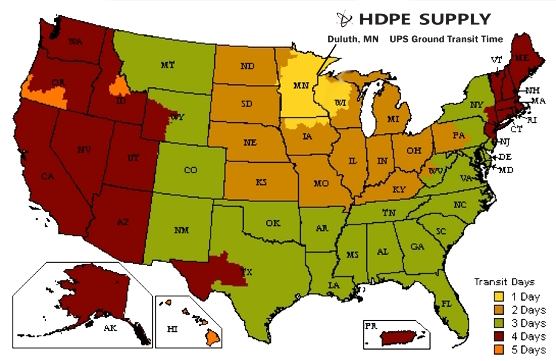 You can view the status of your order 24 hours a day by visiting www.fedex.com or by visiting the hdpesupply.com "My Account" page located in the top right corner of our website. All authorized returns received 1-15 calendar days from the date the order was delivered will receive a full refund minus shipping cost. All authorized returns received 15-60 calendar days will be subject to a 15% restocking fee. Returns are authorized after the order has been inspected. To be eligible items must be unused and in the same condition received. Pipe coils, straight sticks of pipe, fusion tools, fusion equipment, custom fabrication parts and special ordered parts are not returnable. Orders placed with a credit card cannot be returned after 30 days. Commercial and Reseller accounts may return items after 60 days with an applied 15% restock fee for store credit. We reserve the right to refuse to accept any materials returned without our expressed authority. Materials must be returned FREIGHT PREPAID. You should expect to receive your credit refund within four weeks of giving your package to the return shipper, however, in many cases you will receive a refund more quickly. This time period includes the transit time for us to receive your return from the shipper (5 to 10 business days), the time it takes us to process your return once we receive it (3 to 5 business days), and the time it takes your bank to process our refund request (5 to 10 business days). Please call or email us if there are any questions on how to return your items. We can ship to virtually any address in the world. Note that there are restrictions on some products, and some products cannot be shipped to international destinations. Some orders may be required to be shipped via freight transport and may require truckload delivery rates. UPS typically takes 2 to 10 business days depending on the shipping method you select. Be aware that many countries impose import duties on international shipments. Please read information below regarding these fees. UPS charges duties and brokerage fees on international shipments. These charges are not included in our shipping charges and can be costly. If you refuse shipment, we have no choice but to have UPS dispose of your order and will not refund your order or shipping charges.